We are Columbus, Ohio DUI lawyers and Columbus, Ohio criminal defense attorneys serving clients in the central Ohio area. We only practice criminal defense and OVI / DUI defense, we only practice in Columbus and central Ohio, and we only accept a limited number of clients. By limiting our caseload and focusing on a narrow area of law, our firm has established an elite practice with the goals of obtaining favorable outcomes, providing outstanding customer service, and relieving the stress clients experience in the court system. We have done that by developing expertise in a niche practice area, applying that expertise when litigating these cases in court, and consistently communicating with clients as we guide them through the court system. If you were charged with a criminal offense, DUI/OVI offense, or serious vehicular crime in Columbus, Ohio or the central Ohio area, you are probably concerned about the impact this is going to have on your life. You want to learn more about your situation, but most attorney websites are focused on selling you the lawyers’ services. What you need now is information: before you can make decisions, you need answers to your questions. This website provides valuable information about Ohio DUI / OVI issues and Ohio criminal law topics. After you learn more about your situation, you will be in a good position to make educated decisions about how to handle your case, whether to hire a lawyer, and how to choose a good lawyer. 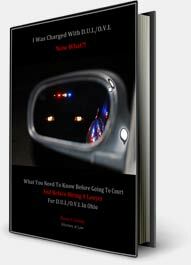 If you are charged with DUI/OVI in Columbus or central Ohio, another good source of information is the guide: ‘I Was Charged With DUI/OVI – Now What? !’ That short guide can be downloaded for free from this website. Before you hire a lawyer, educate yourself about your situation. After you educate yourself about your situation, you may decide representation is necessary. If so, you need to determine which lawyer to hire. The lawyer you hire may be the single most important decision you make about your case. There are many factors to consider when choosing an attorney. Some of the most significant traits to look for in a lawyer include: focus, expertise, and experience. You should also consider results of past cases, client satisfaction, and industry recognition. The Dominy Law Firm practices only DUI/OVI defense and criminal defense, and Shawn Dominy has focused on these areas since the beginning of his career in 1997. He has undergone extensive training specific to DUI/OVI cases and criminal cases. Regarding industry recognition: Shawn Dominy is one of few attorneys on the SuperLawyers® list for DUI/OVI defense in Columbus, Ohio, and SuperLawyers® magazine named him one of the Top 50 Lawyers In Columbus, Ohio (a city with over 8,000 lawyers). He has an AV-Preeminent® rating from Martindale-Hubbell, he is rated a 10.0 on Avvo, and he was named a ‘Top Lawyer’ for DUI defense by Columbus CEO Magazine. For more information about Shawn Dominy, please see his Attorney Profile page. Attorney Bryan Hawkins has also focused on criminal defense and DUI / OVI defense for his entire career. Before joining the Dominy Law Firm, he worked as an attorney in the Franklin County Public Defender office, so he has handled thousands of these types of cases. Bryan Hawkins was selected as one of the Top 10 Criminal Defense Attorneys Under 40 In Ohio. He also received the Avvo Client’s Choice Award based on reviews provided by his clients. For more information about Bryan Hawkins, please see his Attorney Profile page. The Dominy Law Firm takes on a limited number of cases. By limiting the caseload, the firm can work each case thoroughly and provide the level of representation and service you want as a client. We are here to help, so hopefully you can stop worrying. The result of limiting the caseload and focusing the practice on a narrow area of law is a track record of favorable results and satisfied clients. Results matter. An attorney’s expertise and experience are only valuable if they lead to favorable results for clients. If you are considering hiring a Columbus law firm for DUI/OVI defense or criminal defense, one of the most important criteria to consider is the outcomes of cases similar to yours handled by that law firm. On this site, there are pages of real results from cases handled by the Dominy Law Firm. The case results include the circumstances surrounding each case so you can find the outcomes of cases similar to yours on the Case Results page. More important than what an attorney says about himself or herself is what clients say. With the assistance of the internet, we can now read reviews of nearly every product and service. Deciding which lawyer to hire is an important decision, so you’ll want to see reviews from previous clients. On this site, there are pages of real reviews from real people represented by the Dominy Law Firm for criminal offenses and OVI / DUI charges in Columbus and central Ohio. To see what clients say about our representation, please see the Client Reviews page. Not all lawyers are the same: there are varying levels of knowledge, focus and service. Accordingly, there is a wide range of fees among lawyers who handle criminal cases and OVI/DUI cases in Columbus and central Ohio. Based on the firm’s experience, expertise and limited caseload, the fees charged by the Dominy Law Firm are at the high end of that range. The firm charges flat fees, so it is clear from the beginning exactly how much representation will cost. Fees may be paid by credit card or debit card, and financing is available for qualified applicants. For more information about the Dominy Law Firm, please see this site’s About Us page. We have helped hundreds of clients in situations like yours obtain favorable results for criminal cases and DUI / OVI cases. To find out how we can help with your situation, call the Dominy Law Firm at 614-717-1177 or complete a contact form to arrange a free consultation. Before you speak to any lawyer, the best thing you can do is educate yourself about your situation and about attorneys. Not every client or situation is the same, and not every attorney is the same. This site has information that will help you learn about DUI / OVI cases and criminal cases in Columbus and Central Ohio. It also has information about the Dominy Law Firm. Reading through the information on this website will help you make informed decisions. What are the consequences of an OVI conviction? Is it possible to avoid an OVI conviction? My license was suspended; how will I get to work? Should I plead guilty or fight it? This guide is available for sale in online bookstores, and you can download the guide for free here.